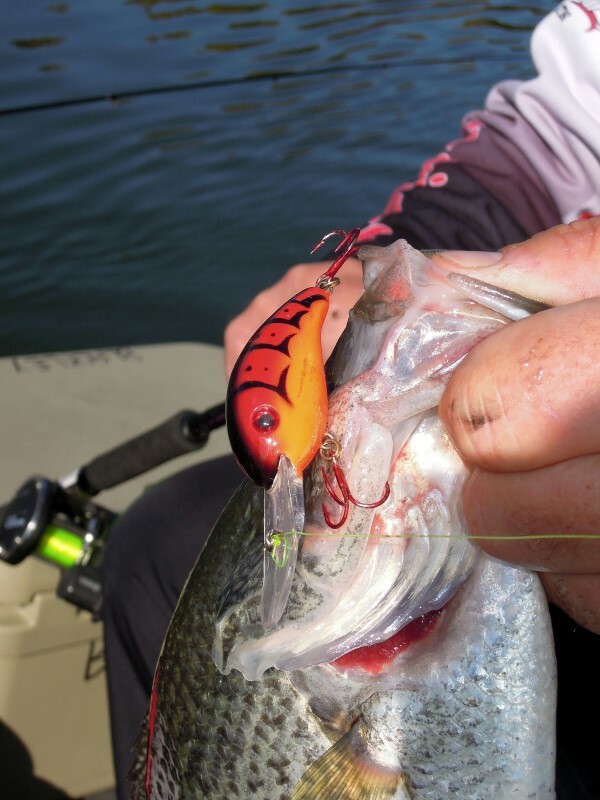 Many anglers pull crankbaits to tempt crappie in the spring thru the summer. Nothing gets dedicated crappie anglers more excited than seeing green buds and blooming flowers marking the coming of spring, which means fat female slabs moving shallow to spawn. Crappie start gathering along creek channels when water temperatures approach 60 degrees. Males move shallow first, looking for a place to spawn. Crappie typically spawn in about two to four feet of water, but sometimes spawn on river ledges as deep as 15 feet. Unlike bass, male crappie don’t really make beds and defend them. Instead, they clear a place near a stump, fallen tree or weedbed to wait for the females to arrive. When females show up, males repeatedly bump them to force the girls to release their precious cargoes. Garrett Steele, a professional crappie angler from Nashville, Tenn., admires a crappie he caught by vertically jigging a metal spoon while fishing in a backwater off the Alabama River near Prattville, Ala.
On big reservoirs or river systems, the spawn may last for weeks because of varying water temperatures. The northeast corner of a lake typically warms first, followed by the northwest, southeast and finally southwest. The north side of a lake receives the most sunshine, but the eastern shore gets the most intense afternoon sun. In addition, warm south winds blow northward while northern shorelines somewhat shelter that side from cold north winds. Shallow waters warm quicker than deep waters. Cooler rivers with current warm more gradually than lakes, so crappie might spawn later on streams. 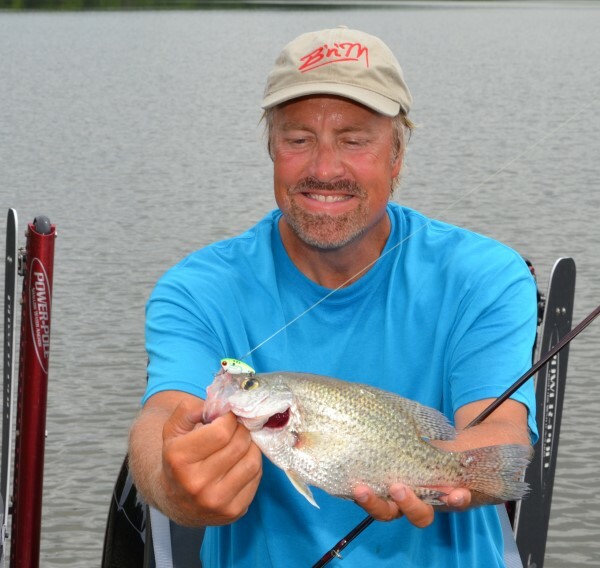 Trolling baits under planer boards is a highly effective way to search for crappie in the spring. Anglers can fish various lures at different depths simultaneously. ie in the spring. Moreover, hard objects absorb solar heat and can radiate that warmth into surrounding waters. While wood can retain heat, rocks, metal pilings, concrete blocks, riprap and similar structures retain more heat than soggy logs or stumps. Just a few degrees of water temperature change could make a difference on a cold day. Before spawning, crappie sometimes gather just off the drop-offs, but move into the shallows to feed. To catch these fish, anglers need to find them. Anglers who find them can usually land a bunch without moving very far. In early spring, many anglers run spider rigs through deeper channels looking for staging fish. In many channels, anglers might find a stump line right on the drop marking an old shoreline. In a creek with current, crappie usually hide behind those old stumps, fallen trees or other obstructions that disrupt the flow. When fishing creek channels, put some baits on the edge of the drop, some at mid-depths and some just off the bottom. To fish sloping shorelines and ledges along creek channels, many anglers cast slip-cork rigs baited with jigs, minnows or a combination. With this rig, anglers can fish varied depths vertically. Throw it as shallow as possible and work it out over the drop. Periodically, twitch and pause it. Crappie regularly spawn so shallow or in such thick cover that anglers can’t even tempt them with slip-cork rigs. In this case, approach as close as possible without spooking them. Use a long pole to vertically drop baits next to stumps, weedbeds, standing timber or other cover. In the South, crappie habitually spawn next to cypress trees growing in shallow water or amongst the visible root systems called knees. Spawning fish won’t chase baits far. Sometimes, anglers almost need to tickle their noses to make them bite. Subtly place tiny temptations in pockets and work every likely hiding spot from all sides. For example, probe each pocket between branches on a fallen tree. Let a diminutive bait like a hair jig sink naturally without any added action. Don’t vigorously jig it up and down. One insignificant sweet spot could produce the most fish. Perhaps currents push bait to that side or maybe sunshine warms a pocket slightly. Try to determine patterns. Sometimes, anglers almost need to tickle their noses to make them bite. After the stressful spawning process ends, females must regain their strength so they feed ravenously, but scatter. During the post-spawn, planer boards provide an excellent search technique. Anglers can run various baits on boards as far apart as they want any distance from the boat. This covers considerable territory. 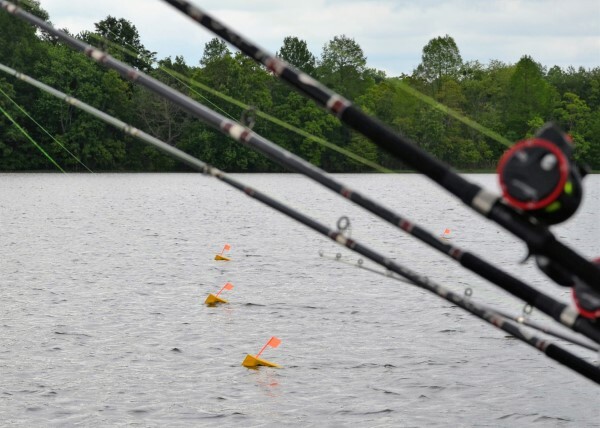 Anglers could even set boards to run parallel to drops on either side of a channel. From shallow stumpy flats to wooded shorelines pockmarked by little eddies, to deep holes, anglers fishing rivers might encounter just about any cover type imaginable in a small area. Whether casting corks to shorelines, spider-rigging jigs in a channel or pulling crankbaits under planers, anglers might catch a lot of crappie in the spring if they remain flexible and willing to try different techniques. They could also catch their biggest fish of the year wherever they go.